Upload the MAIN theme folder. This is the folder located inside the “upload” folder in the zip file that you downloaded from Themeforest. When it askes to select a file find the zipped theme folder located in the “upload” folder in the zip downloaded from Themeforest. After the theme activated, install plugins by clicking link Begin Installing Plugin. You need to install GT3 Page Builder plugin and LayerSlider WP plugin. 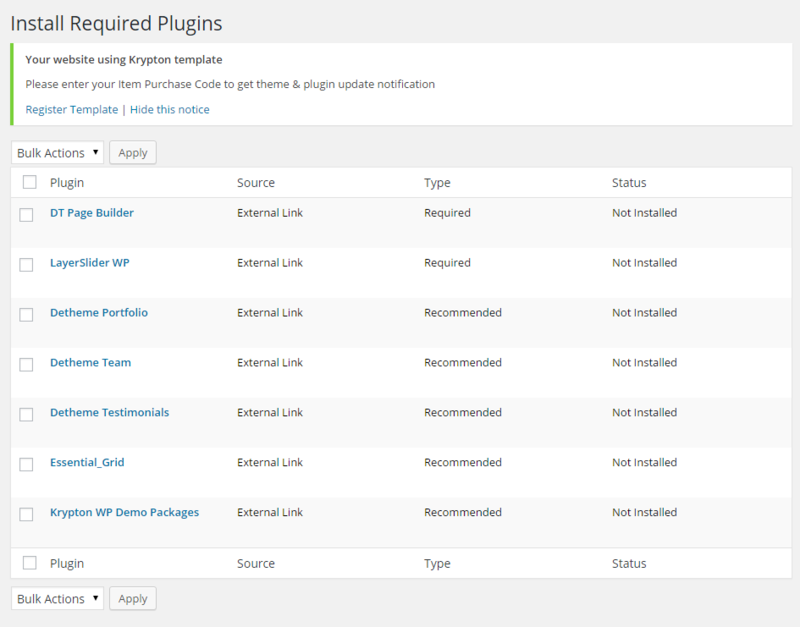 After the plugins active, Krypton Theme is ready to use now ! Krypton theme supports WooCommerce Template. To understand how to use WooCommerce Plugin please read WooCommerce Plugin Documentation. After the GT3 Page Builder plugin and LayerSlider WP plugin installed, you need to activate the plugins through menu Appearance > Install Plugins.